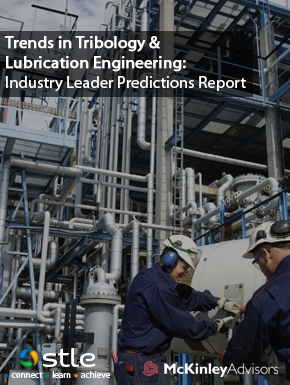 STLE's 2014 Report on Emerging Issues and Trends, is the culmination of a multi-phase research effort to evaluate current trends and to predict future developments impacting tribology and lubrication engineering. The research encompasses the global opinions and experiences of nearly 1,000 tribologists and lubrication engineers who participated in the project as advisors, interview and focus group participants, and survey respondents. The 80-page report is divided into nine major areas: the outlook on the field, energy, manufacturing, transportation, atomistic processes, other tribology topics, government regulation, safety and the environment, and basic human needs. Single print copies of the full report are available. Order a printed version of the full report by adding to your online cart. Please be certain your mailing address is correct in your record prior to ordering for fast processing. Shipping charges will apply. For multiple copies, please contact the STLE office to arrange order.